New York Fashion Week is upon us, an event that brings the best designers in the world together to showcase styles that will drop jaws and set the next big trends. If you have had the privilege of attending the runway shows in-person, or even watched them on TV then you understand the allure and excitement. Some outfits are so progressive that they look like something out of a sci-fi movie, or possibly a fashion trend that won’t catch on until fifty years from now. I think that’s part of the fun of it all, and seeing true artists that don’t hold back in their creative craft. It’s fun for me to watch the men’s fashion that’s showcased at New York Fashion Week. It doesn’t hurt that the men wearing the clothes are stunning models, but I also enjoy keeping up with the new trends that might hit. I do enjoy the women’s runway shows much more though, for selfish reasons and also because women’s fashion is as a whole seems a bit less confined. Couture dresses and flashy skirts make the world go round! A special day or night out for a woman often entails putting on a dress or skirt, a special necklace or other jewelry, and a great pair of heels to tie up/together the whole ensemble. This could be for a wedding, date night, or just a night out to look and feel good. For me, this happened this past week, and was probably brought upon by some of my excitement for the upcoming New York Fashion Week. There are a few go-to dresses and skirts in my wardrobe that shape my body well and have colors and patterns that work with my look. However, I feel my absolute best when wearing a brand new dress and new set of heels. The big drawback to wearing the best looking heels is the discomfort and even pain that our feet will be feeling, even after just a short while. I can’t even count the times that my tired feet have put a damper on my fun… forcing me to sit down at every bench I see, watch on the sidelines while others dance and have fun, or having to carry my heels and walking barefoot in a public place. I know I’m not alone, I see other women doing the same things all the time! I’m really excited to tell you about my experiences with Dr. Scholl’s® Stylish Step™ as it has completely changed the way my feet feel in even in my high heels. I am able to move about throughout the day and night without all of that painful pressure on the balls of my feet. 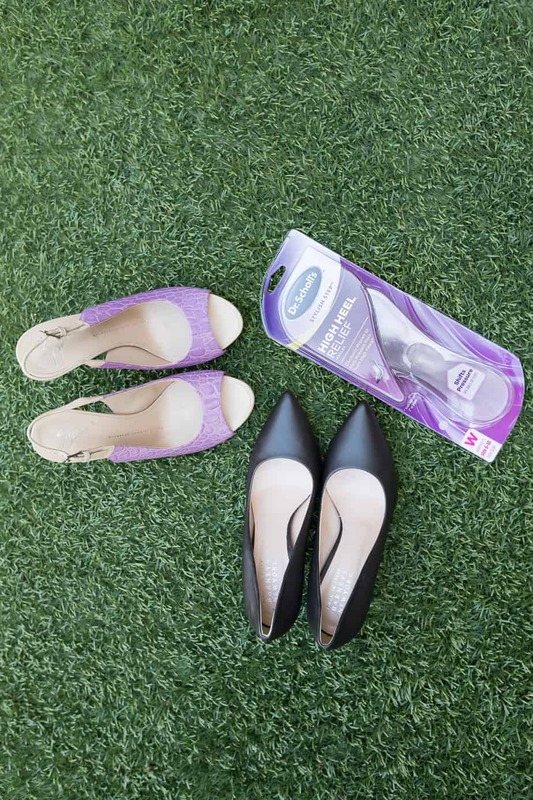 The Stylish Step™ High Heel Relief insoles has a gel arch that lifts the pressure off the ball of my foot, so it prevents foot pain and keeps me comfortable. One of the surprise benefits that I noticed was that my feet were much less sweaty after a few hours of wearing heels. I’m not sure if that’s something they promote but just a personal observation for myself. Dr. Scholl’s is one of those trusted brands that has been a leader in their space for many years. I’ve tried other insoles before but never experienced anything like these that are specifically designed and even clinically proven to prevent pain in high heels. I love that! The shoes design is completely different in every way from flats, so the support around them to be designed accordingly. Dr. Scholl’s Stylish Step™ are available in the healthcare aisle near the pharmacy at Target stores. Right now you can get 10% off using the Cartwheel app! Learn more here. There’s a special feeling that I think we as women all know about when we are looking and feeling our best. That feeling should not be compromised by anything, especially pain. Dr. Scholl’s Stylish Step™ really comes to the rescue so we can walk with confidence at the big gala, stay on our feet for a full day of shopping, or keep dancing until the last song. Save 10% off using the Cartwheel app! You know, I’ve seen these so many times before and contemplated getting them, thinking they’d make a world of a difference. A must have, I need to get!